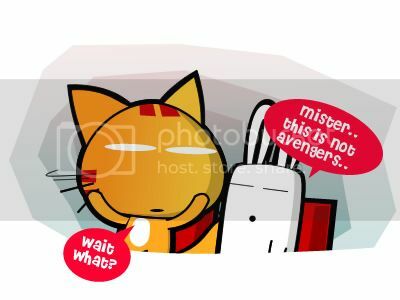 Miao & WafuPafu Comic Blog » This is not Avengers. I went into the other movie which I could not remember what movie is that. XD. 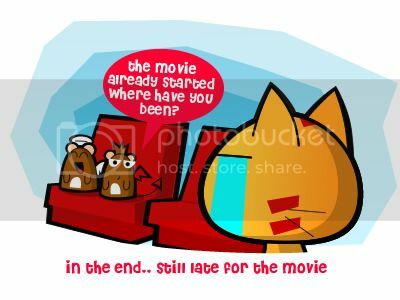 Then again, I need to go out often especially the cinema else I gonna went into the wrong cinema hall again. Have you ever like went into the wrong venue before? I heard some people ever went in the wrong toilet, I wonder how that can happen. 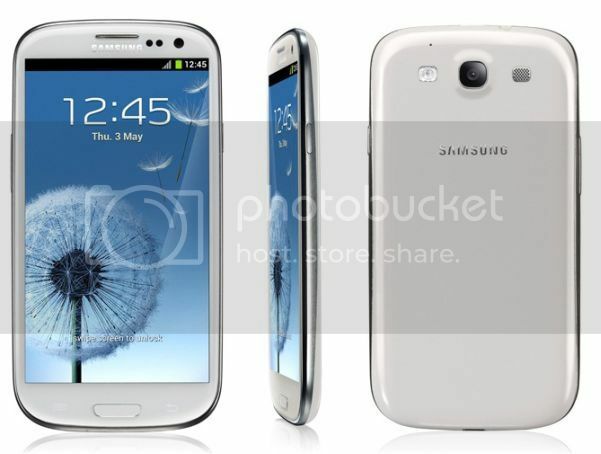 Samsung Galaxy S3!! The talk of the town!! With Android 4.0, Ice Cream Sandwich, 4.8” HD Super AMOLED, 64GB via microSD, NFC (S-Beam) feature, it is the one of the best Android smartphone in the market. What’s more awesome than having it with Celcom, the widest network in Malaysia. With Celcom Exec Plans, you can get Samsung GS3 from as low as RM1,398!! Yes, just RM1398 for one of the best Android phones in the city. Isn’t it amazing? For more info, click HERE. Quiz: What is Miao's Response? Posted on June 21, 2012 by Jian Akiraceo. This entry was posted in Cinema and tagged avengers, blur cat, comic, miaow, wafu pafu, wafupafu, wrong cinema hall, wrong movie, wrong venue. Bookmark the permalink. hahahaha but we can’t do that over here. they just open the hall when they gonna show it. If you looking for some BBQ crab, Hijau at BDC has a stall which have probably the best bbq crab (that is if got crab la). The stall is 1st one once you reach frm the entrance (got boat “bai sui” at there). Open at 6pm, so don’t go there at afternoon. Nope. Never went to a wrong cinema. Hope wont be, ever. Sarawak’s food eh…I really like to try some since you like to talk about that. Where the best in KL? Real one have to visit Sarawak 😛 but there’s some in KL/PJ area. Mee tomato so-so, Ayam Pansuh underseasoned. It happened to me! My brother, his friends and I were to watch a movie titled “The Spirit”. But we got confused which cinema hall is which as the cinema hall number was between two different cinema hall. So we tried our luck and enter one cinema. And it so happened that the cinema hall that we entered wrongly was playing that movie. But then it played for like half an hour and the end. We thought that it can’t be that short then we came out of the cinema hall and found out that mistakenly entered another cinema hall. The one we were supposed to go was already playing half way. So, we checked almost all the cinema hall to see what movie was playing. In the end we ended up watching “Australia”. Woahhh O_O what an experience. going in the wrong cinema is better than buying the wrong movie!! i bought this movie called ‘The Awakening’, thinking that it is ‘Underworld 4: Awakening’… watched until half way only my friends and i wondered y no vampires or werewolves appear yet? -_-” the movie don’t even show the title at the beginning… zzz… faints diao…. hahaha.. XD that one really GG. no choice to finish the whole movie. What’s this awakening movie about? ghost? Besides , try the laksa in ” ji xiang ” at green road there. its a shop-house. 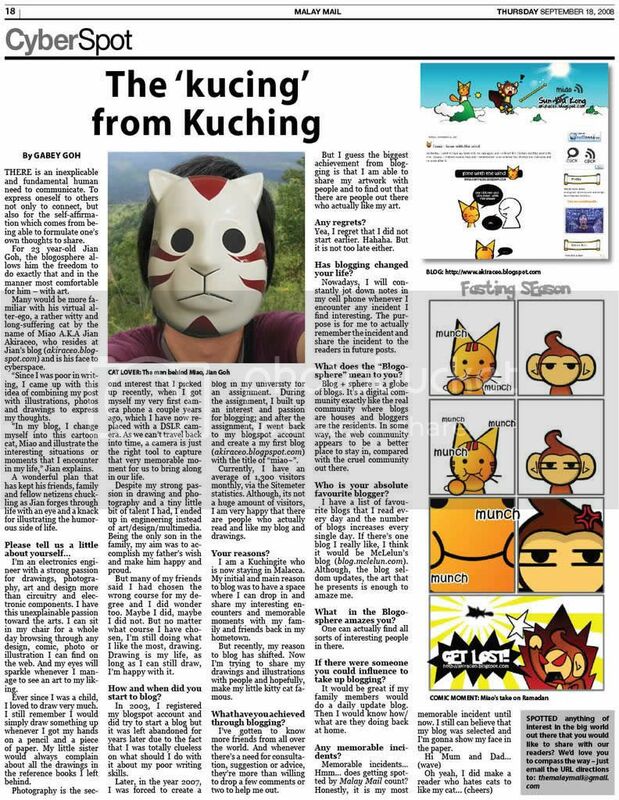 kuching famous food ?hmmm laksa and kolok mee0? *cheap and awesome* !!! hmm green road xin lian cheng kolok mee?jin men (third mile roundabout)laksa?quan chun laksa?ayam penyet ?hmmmm…..what else hor ? Funny..Hahahaha. Why didn’t notice that your friends aren’t around when you sat down ? Hahaha. Cat, check this blog if you have time. It’s cute too. I was like…What is this? Too me a minute to realize i was in the wrong hall. I like kolo mee at Kim Joo 73 Ewe Hai Street, Kuching. Tasty, clear soup with meat and bean sprouts, friendly fat guy, open 6.30am to 2pm, closed 1st and 15th of each month. The best “kuay chap” is at Yun Nan Yuan (Southern Cloud Garden) coffee shop at 182, Song Thian Cheok Road, Kuching, every morning except Mondays. And Lau Ya Keng, 23 Carpenter Street Kuching has fantastic, authentic kolo mee with black vinegar and Teochew dumplings every morning till 2.30pm, pork satay 12.30-2.30pm, excellent “kuay chap” and fish porridge from 5pm-9pm. I like kolo mee at Kim Joo 73 Ewe Hai Street, Kuching. Tasty, clear soup with meat and bean sprouts, friendly fat guy, open 6.30am to 2pm, closed 1st and 15th of each month. The best “kuay chap” is at Yun Nan Yuan (Southern Cloud Garden) coffee shop at 182, Song Thian Cheok Road, Kuching (behind Secret Recipe), every morning except Mondays. And Lau Ya Keng, 23 Carpenter Street Kuching has fantastic, authentic kolo mee with black vinegar and Teochew dumplings every morning till 2.30pm, pork satay 12.30-2.30pm, excellent “kuay chap” and fish porridge from 5pm-9pm.